As you can see the popup is blocking the view to the task list and the progress bar. I've created a little tool which will run as a pre- & post install task. It will set the focus to the deployment window every second. So every script, application or whatever will switch to the background and you will always have the clean status page in front of you and your customers. Of course you need to duplicate the task and run it again after a restart in your post-install routine. If there is an error in your deployment and the error page appears the script will pause. So you can work with notepad / cmd or whatever until you resume your task execution. You can manually pause the script with the key combination mentioned in the task description (you'll see it after an import to your SDA). The tool is delivered as it is and has no support - questions will be answered here. i recently created a little PS-Script which will help you if you need to deploy an MUI version of Windows 10.
depending on the hostname: Install a language pack and set the default locales. The Post-Install task can be imported easily to your SDA but needs some modification on your site. For legal reasons i removed the language packs from the specific folder. Feel free to add and change the needed files / folder / whatever. Remember that every Windows 10 Build got his own language packs. The script is delivered as it is and has no support. If you have any questions feel free to ask here on ITNinja. 01/09/2018 update: added a Report and another CIR. 02/02/2018 update: corrected & updated the vulnerable report. Added a new report with secured devices. here a quick blog to check the hardware vulnarabilities CVE-2017-5715, CVE-2017-5753, CVE-2017-5754 or better known as Spectre and Meltdown. I am using the Microsoft security guidance ADV180002 as base script with KACE modifications. The outcome of this blog will be that you can easily see, filter, report and label all your Windows clients higher than Windows 7 SP1 or Server 2012 R2 which are vulnerable or secure against Spectre and / or Meltdown. To archive this we first need a script. The script looks like this and can be downloaded here. If you need assistance to import it to your KACE SMA (K1000) please feel free to contact me. The script will create the logfile: "C:\Windows\Logs\KACE_CPU_Check.log" and rewrite it every time. To have the posibility to search, label and report these data we need a CustomInventoryRule. Here you have a screenshot and can find the export as a download here. After that you should be able to filter everything like you know to do it. Enabled protections appear in the output as "true". If you go to the details you would see that this device is vulnerable against both. Now you want to check with one klick which devices are vulnerable and compatible to get patches through Patching. To do that we first need again a custom inventory which checks if the compatibility registry key is available. You can download the ready to use package here. The next step is to import a report which shows all vulnerable devices. The package can be downloaded here. Additionaly i have created a report which will list you all devices which are secure. You can downoad it here. 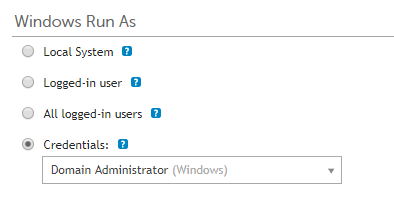 You can modify / add / delete everything wihtin the scripts, custom inventories or SQL-Reports. If you rename your custom inventory rules change the names in the SQL query too. This blog will focus on an ongoing management of AD security groups. First i have to say the main script is written by OneScript Team. The idea here is to use KACE SMA to have an sheduled or an adhoc script wich will assign devices to specific AD securitygroup(s). After that we have to decleare on which device(s) it should be deployed to. Here you can choose to leave it empty or using a specific smartlabel or whatever you need it for. After that you have to add credentials of a user who has the right to add the targeted devices to the targeted AD securitygroups. We don't need a notification and the shedule is up to you. Maybe you wan't to run it every monday to be sure that every device is in the correct group(s). 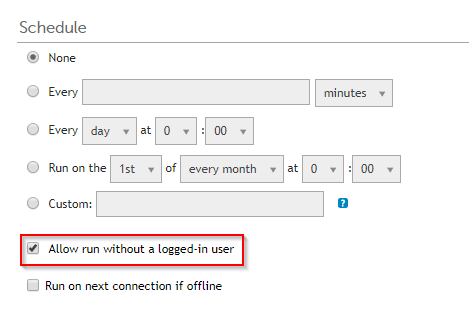 Necessary to check is the "Allow run without a logged-in user". 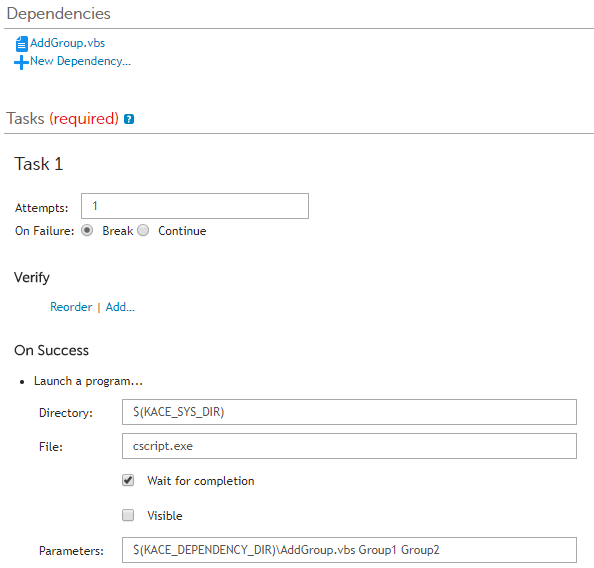 And now the final step: Upload the VBS as dependency and configure a task (or multiple). Of course you can do here whatever you want. Feel free to proof registry keys or whatever you like before adding a computer to an AD securitygroup. You can add all securitygroup names seperated by a space as an argument. 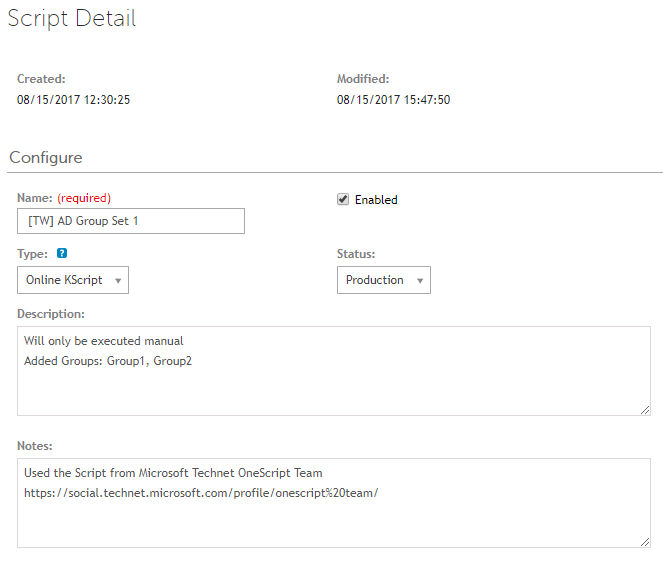 So you are able to create different sets of joining ad groups in one task. Please note that this is a selfmate script without vendor support.